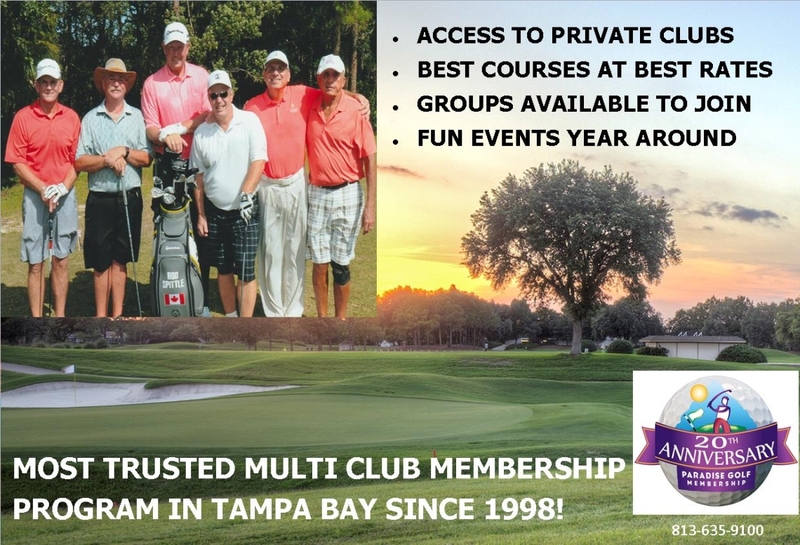 A TRUSTED NAME IN TAMPA BAY GOLF SINCE 1998! WHAT IS A PARADISE GOLF MEMBERSHIP? A full year of tournaments and play days calendar for competitive golfers and fun golfers often at clubs that participate on the membership and tee times program including Black Diamond, Golden Ocala, Southern Hills, Innisbrook, Cypress Run, TPC Tampa Bay and many more! CLICK HERE for information about and to join our Summer Membership program which started April 1, 2019. Additionally, if you want to save money off the purchase price of both the summer and the winter memberships, then purchase our combo membership which gets you a year of golf while saving up to $56 off the purchase of both memberships. Our combo membership for summer 19 and winter 19/20 will run you $259+tax and shipping. CLICK HERE for details and to join our combo membership! PARADISE GOLF - YOUR VIRTUAL PRIVATE GOLF CLUB WITHOUT WALLS!